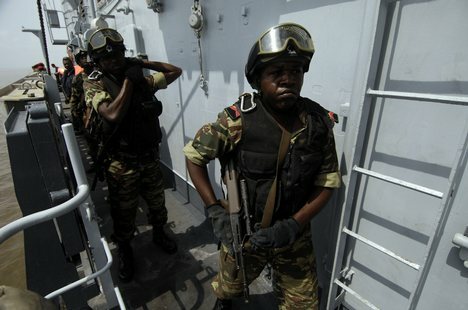 Cameroonian Navy sailors made history as they took part in a three-day combat lifesaver course at the region two military hospital in Doula, Cameroon, March 19- 21, 2012. This is the first course taught entirely by Cameroon military to their fellow service members, while members of the Africa Partnership Station (APS) medical training team observed, and is the second phase of a collaborative effort between the Cameroon military and APS. The lack of properly trained medical personnel in certain areas of Cameroon has inspired many to take action and make a positive impact. The APS staff visited Douala last week to provide a refresher course for the instructors and their roles have shifted from teacher to mentor. APS is an international security cooperation initiative facilitated by U.S. Naval Forces Europe-Africa, aimed at strengthening global maritime partnerships through training and collaborative activities in order to improve maritime safety and security in Africa.